Natasha Pulley lives with her family near Ely, in the fens. She studied English Literature at Oxford University, where she first had the idea for The Watchmaker of Filigree Street. 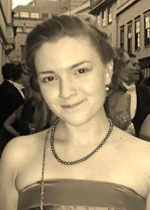 After graduating, Natasha taught English in China for six weeks. It was there that she learned what being a foreigner is. After stints working at Waterstones as a bookseller over Christmas, then at Cambridge University Press as a publishing assistant in the astronomy and maths departments, she did the Creative Writing MA at UEA. When not writing (which is almost never) she likes reading. She loves ghost stories and historical fiction. At the moment she is making her way through as much Japanese literature as she can get her hands on, and she's learning Japanese (slowly). She writes because fiction is a much more exciting place than the real world, in which you must buy milk and understand Microsoft Excel.